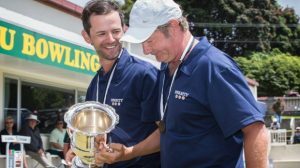 History was created in the mens pairs final of the New Zealand Bowls Championships when Gary Lawson (Sumner) and Neville Rodda (Victoria) claimed the title in New Plymouth on Sunday morning. Lawson took the all-time record for the most titles won by a man at the New Zealand bowls championships with his 11th. Lawson and Rodda held the upper hand throughout their match against Nelson’s Ali and Neville Forsyth, taking the match 16-11. Rodda, an Australian who has lived in the capital for the last two years, set up his skip Lawson for victory with a dominating performance off the front. “I’m ecstatic,” Lawson said. “We went out there and just wanted to keep drawing shots. But we also wanted to leave a few holes.” Lawson acknowledged how tough a final it had been and noted that Ali Forsyth is currently the best attacking player in the world. Lawson and Rodda also had more than share of luck but consistently picked up ones and twos and led 12-3 after 10 ends, with the gap being too much for the Forsyths to overcome. On Saturday, Raymond Martin lost in the quarterfinals of the men’s singles 16-21 to Blake Signal (Stokes Valley), and Jeremy Kydd and Laurie Guy lost their quarterfinal of the pairs to the Forsyths 10-19.